Dengler is a senior who has demonstrated a wide variety of talents while at Pope John. We at Pope John XXIII Regional High School want to share with you a new series called “Pope John Student Spotlight” in which we recognize our students’ talents and achievements! Today, we want to showcase Ryan Dengler! 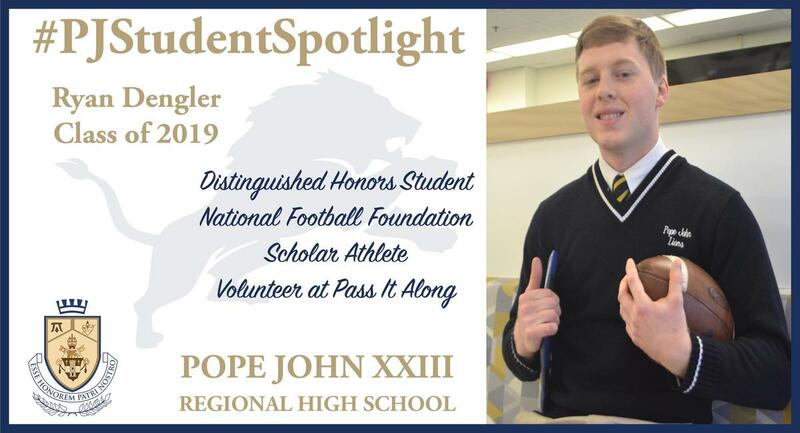 Dengler is a senior who has demonstrated a wide variety of talents while at Pope John. He has earned Distinguished Honors in the classroom while taking courses such as AP Psychology, Calculus, Forensic Science, Honors English IV, and History of Great Trials. Dengler was also selected as a Scholar Athlete for the Greater Morris County Chapter of the National Football Foundation and College Hall of Fame. Dengler is a captain of the football team and a volunteer for Pass It Along and the Saint Kateri Squires, a youth leadership organization for the Knights of Columbus. Dengler will attend Lafayette College, where he will continue his academic and football careers.